The forecast for today was sunny and WARM! It was also the Sunday the clocks went forward which is an ideal opportunity to go for an extra early walk. 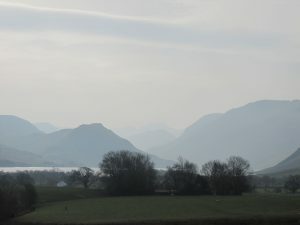 It was a bit hazy, one of those days when outline and shape are stronger than colour. 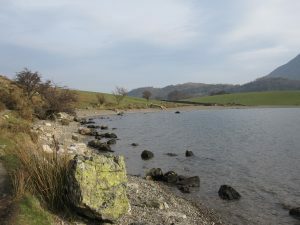 Wattie and I went down to Crummock and walked around the shoreline. 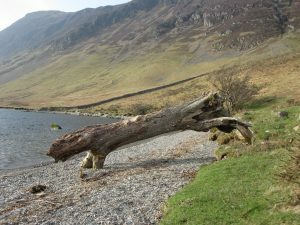 The log that looks like some prehistoric animal changes with each winter but it certainly looked as if it was heading for a drink at the lake today. 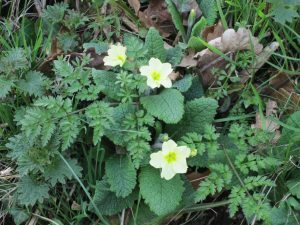 We had a lovely walk, met no-one apart from the obligatory fell runner and on the way back saw the first primroses out down the lane. I spent the rest of the day gardening in the sun. The ewes in the field in front of the house must be a week or so off lambing and are very hungry. When they hear the farmer coming with their hay, they charge to the gate bleating fiercely. He must have been two or three times today. My neighbour, Naomi , and I were very concerned over the past couple of weeks as there had been a grey squirrel visiting one of our feeders. We contacted the local red squirrel group who were very helpful and supplied us with traps and after a few days we managed to catch the offending grey. We also caught two reds who were extremely cross!